Elana Simon is the Administrative/Office Assistant for the Arms Control Association. She is responsible for member and donor engagement, public event and fundraising coordination (including our annual meeting), assisting on grant writing and reports, liaising with the Board of Directors, and supporting press outreach and communications. 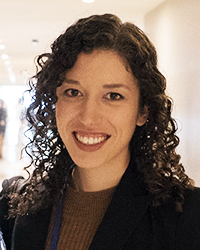 Elana joined the Arms Control Association in 2018. She previously worked for Physicians for Social Responsibility and interned with ReThink Media’s Peace & Security Collaborative where she focused on communications and nuclear weapons policy. Prior to her work with disarmament organizations in Washington, DC, Elana was a Fulbright English Teaching Assistant in Taiwan. She holds a B.A. in Politics with honors from Whitman College.